To work on their new technology/knowledge/innovation based startups. To enhance the pipeline in terms of quality and quantity of innovative startups to the incubators. Individual innovator: He/She is required to be Indian Citizen at least 18 years of age as on date of application. An Indian citizen is defined as one who is in possession of a government approved proof of nationality such as a valid passport, voter’s id etc. a) The company is less than 2 years and wants to develop the prototype for a new product, for which they may have not received similar kind of support. b) Company should have no significant revenue at the time of application. Team of individual innovator: If the team wants to pursue the project, then there has to be an agreement among the team about the lead applicant and the lead applicant have to apply for NIDHI-PRAYAS. The financial support (after the selection process) will be given to the lead applicant on behalf of the team. The maximum support can be provided per innovator/incubatee is upto Rs. 10 lakhs. If the innovator is pursuing to build a prototype from their institute/organization IP, then in that case innovator will take NOC from the appropriate authority of their institute/organisation for use/IP transfer / ownership in favour of the innovator/startup. The NIDHI-PRAYAS grantee should be registered for the pre-incubation or incubation program at the TBI for the entire duration of the program, after going through the TBI’s selection process. 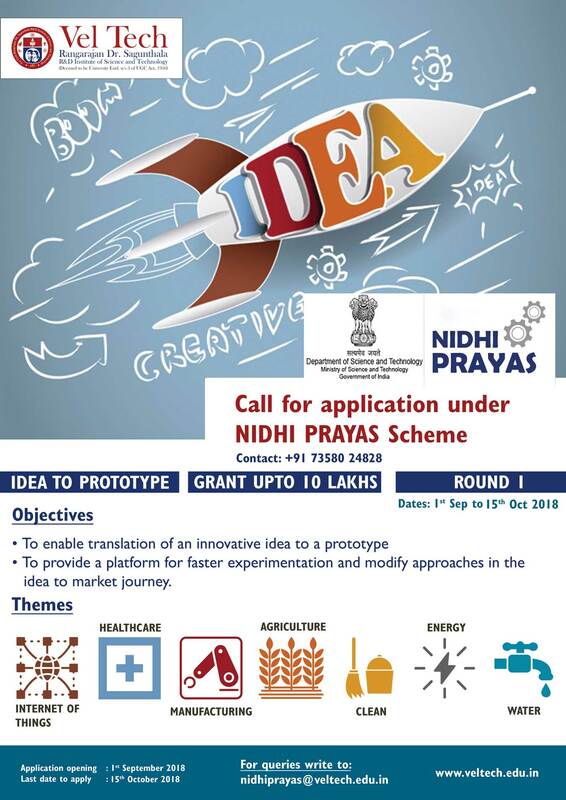 The innovator can avail the NIDHI-PRAYAS support only once and they should not have sought the similar support previously, from other Government of India organisation/Institution for the same innovative concept as proposed in the application form. The projects relating to software development and those involving pure academic research are not eligible. Vel Tech Rangarajan Dr.Sagunthala R&D Institute of Science and Technology.